Home Advertise on Australian Manufacturing. Please download the 2017 Media Kit. 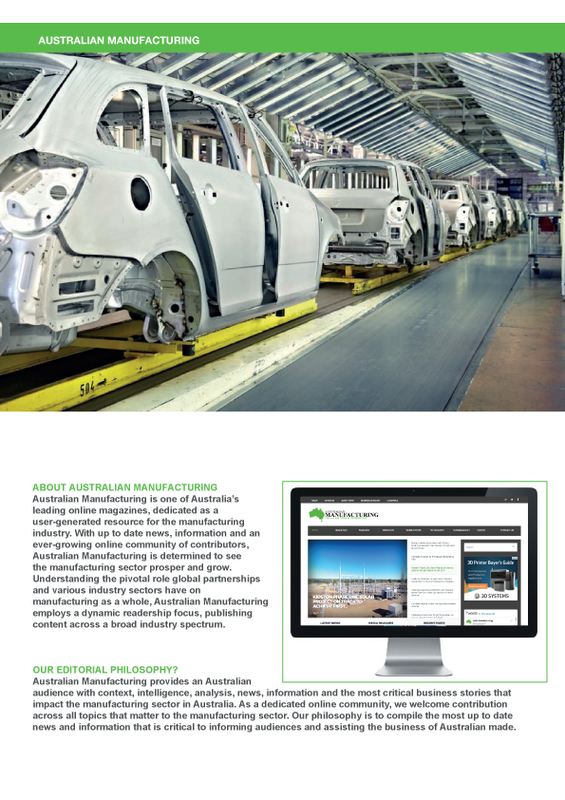 Australian Manufacturing is one of Australia’s largest online magazines, dedicated as a user-generated resource for the Manufacturing sector. Having started from humble beginnings, Australian Manufacturing has developed into a market leading industry magazine with a niche, dedicated and ever growing readership base. With experienced writers from all around Australia and the Globe, Australian Manufacturing is updated daily with quality, industry related articles and resources. Australian Manufacturing reaches over 70,000 page impressions a month. Approximately 20,000 visits and over 10,000 unique visits a month. As a leading digital media resource for the manufacturing sector, the magazine has a combined social network of over 10,000 active social media users and our weekly newsletter is delivered to over 5,000 subscribers. For more information or to purchase advertising space please download our 2017 Media Kit.